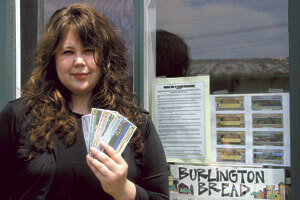 Burlington Currency Project (BCP) existed for 10 years in Burlington, Vermont, USA (1997 to 2007) and administered the community currency, Burlington Bread. There were many distinct phases during the life of BCP. It started out as an adhoc group of volunteers and eventually found a level of institutional and city support before closing due to a number of factors. This history attempts to outline the thoughts and choices of the people involved in the project and results they achieved. Primary sources were examined, including meeting minutes, newsletters, directories, personal communications, newspaper articles, interviews, action research and previous classwork done by Amy Kirschner at the University of Vermont.